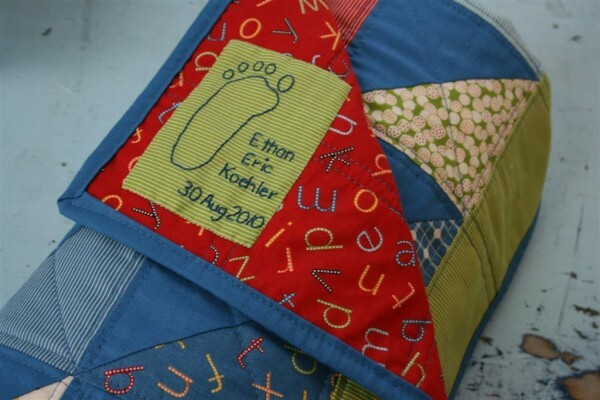 Years ago I began embroidering my child’s name in the corner of the baby quilt I made for them. 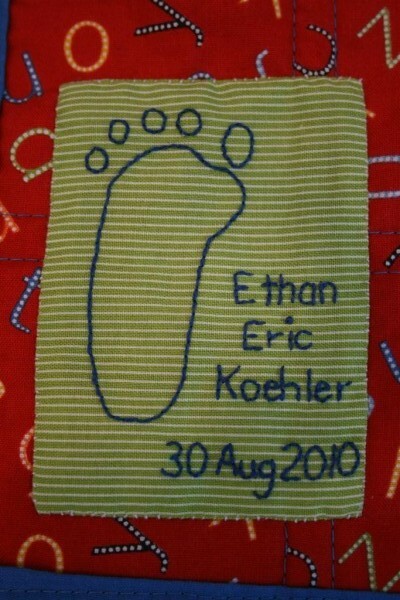 Last year it occurred to me that I could add a hand or foot print to the tag. 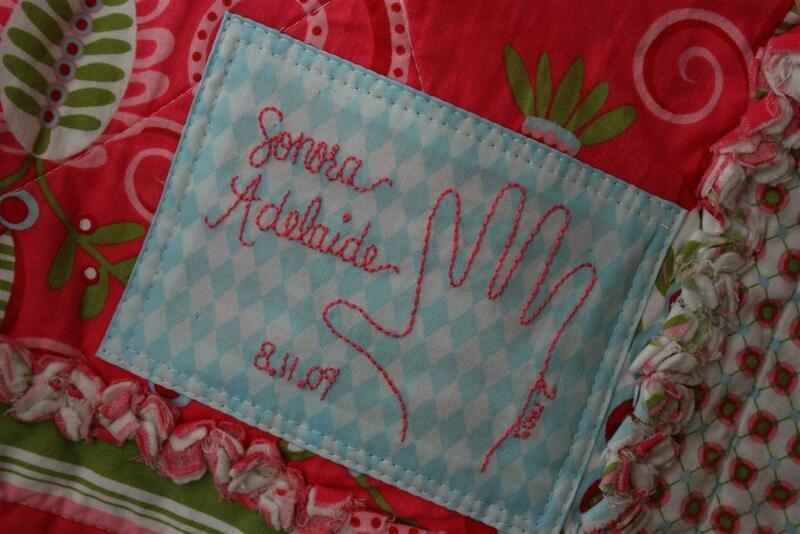 I traced her hand on a piece of paper, transferred it to the fabric and wrote the name and birth date nearby. An hour or so of embroidery and it was done. On this quilt, I ironed the edges under, then stitched twice around using my machine. This meant that I was sewing through all layers of the quilt, making a rectangle of quilting lines on the back. 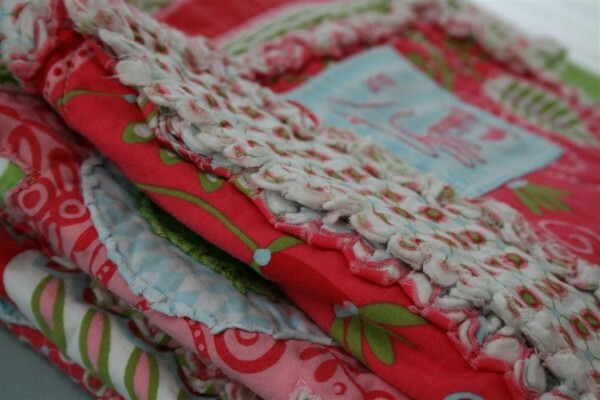 Because it’s a rag quilt and has a scrappy feel to it, I felt that the additional quilting lines wouldn’t detract from the overall look or feel of the quilt, and I also felt that the tag fit well on the front of the quilt for the same reasons. 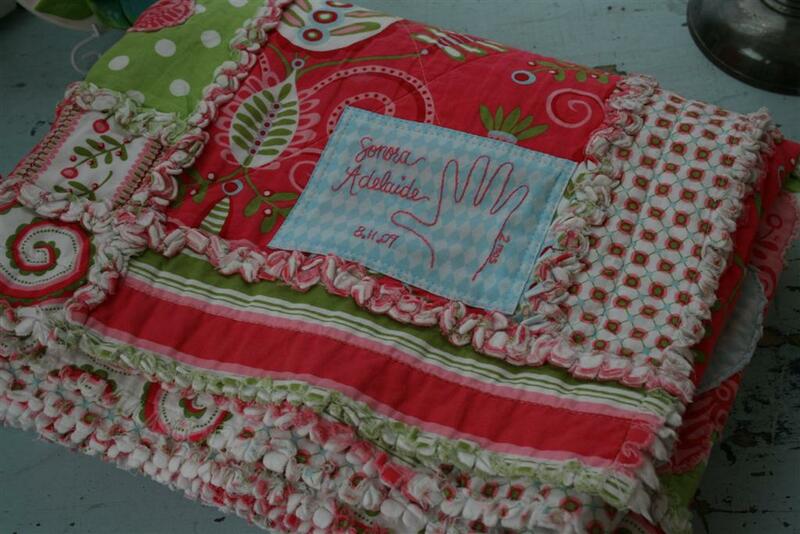 It’s a wonderful reminder of how small she was, and I love to watch her touch the embroidered lines. I recently finished another baby quilt, a gift for a friend. I decided to put a tag on it as well. This tag was placed on the back of the quilt, as I felt it would look awkward on the front. Because I didn’t want inconsistent quilting lines showing on the front of the quilt, I stitched this tag on by hand, being careful to stitch only through the backing and the batting without piercing the quilt top. To get the tiny footprint, I called my friend’s mother while she was staying with them to help. She traced the footprint when he was just a few days old, and her teenaged son smuggled it to my car when I stopped by for a soccer carpool. Thus, the little tag was a complete surprise to my friend. While it takes a bit of extra effort, I thought I’d share the idea. It adds an extra touch of sweetness and thoughtfulness to a handmade gift. After all, they’re only little once!